Sprint IP Relay allows people who are Deaf, Hard of Hearing, DeafBlind or have a Speech Disability to use an internet connection, a computer or mobile device and a relay operator. You type what you want to say to the operator, then the operator relays the message to your caller and types their response back to you. Major Internet browser such as (Microsoft Internet Explorer, Firefox, Google Chrome, Safari) that are supported by the manufacture. Sprint Relay Customer Service notifies user identity verification is complete. The pacing feature allows IP Relay users to inform the Relay Operator to decrease or increase the typing transmission speed. The Sprint IP Relay transmission speed begins at 1800 (word per minute) WPM. Speed can be reduced to 10 WPM. Inform Relay Operator at the begin of each call. “Please lower speed to 40 WPM.” If a slower speed is needed, please ask Relay Operator to reduce by 5 WPM increments. Sprint IP Relay user can update their Customer Notes through mysprintrelay.com. Login with same username and password for SprintIP.com or the Sprint IP Relay mobile app. Click “Notes”. Notes are available for all calls. Sprint IP Relay User may contact Sprint Accessibility Care (Customer Service) through SprintIP.com. Connect to Sprint Accessibility Care representative and request that they add a note. “Lower to 40 WPM”. IP Relay user may choose their preferred transmission speed. Enter your call-back phone number. The phone line must be a voice number with three-way conference capability. You will be connected with a relay operator. The relay operator will call you at the call-back phone number. You may then conference in the party you’re trying to reach. The relay operator will TYPE the hearing caller's responses that appear on your Internet browser screen. You will be able to USE YOUR VOICE directly to your caller on the second line. The relay operator will READ your typed responses to your caller. You will be able to LISTEN to your caller's responses directly on the second line. The Federal Communications Commission (FCC) has ruled that International calling through Internet relay services is not allowed. Your IP address will be identified as a call originating outside of the United States and its territories*. Therefore, your call cannot be completed using Sprint IP Relay. You are welcome to use Sprint Relay International Service (using a TTY) at 605-224-1837 to complete your international relay call. From the device that received the error, please open your web browser and enter www.whatismyip.com. Record your IP address from this site. 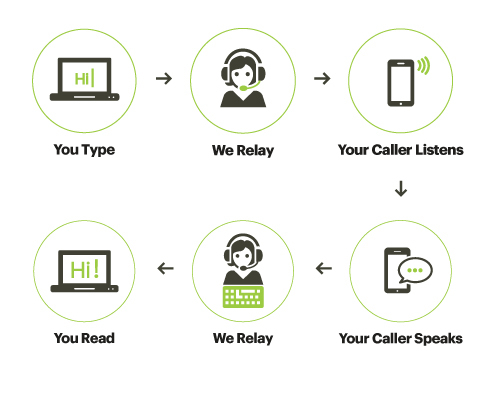 Contact Sprint Relay Customer Service at 800-676-3777. Provide the product that you were using (Sprint IP Relay). Provide the IP address that you recorded. *Callers cannot use websites that mask or change their IP address or identity.